Have you ever got a lipids profile? A nice recommendation is to get a lipid profile by the age of 20 y.o. Probably you have heard about “good cholesterol” (HDL) and “bad cholesterol” (LDL). Actually, we know that the rised levels of good cholesterol are better than the low levels of bad cholesterol. Decreases the risk of heart attack. Slowing the growth of atherosclerotic plaques. Decreases the risk of cardiac arrhythmias. Increases your joint and skin health. 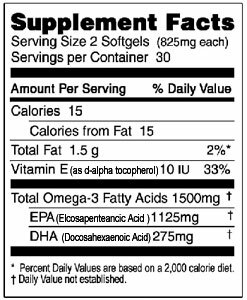 Omax3 is the ultra pure Omega-3 supplement and deÃ±overs greater tjan 91% per softgel capsule (while most supplements just deliver only 30-60 percent). This product is manufactured by highest quality standars: pharmaceutical grade, molecularly distilled, independently tested and free from contaminants. They also accept International orders. I think I’ll give it a try.